The exquisitely crafted emerald and diamond encrusted Godman Necklace, which is part of Her Majesty Queen Elizabeth II's personal jewelry collection, was a gift by the two elderly Godman sisters to her majesty the Queen. The name "Godman Necklace" reflects the name of the original owners of the necklace. The two sisters who remained unmarried and were spinsters inherited the necklace from their father Frederick Du Cann, a British naturalist, who purchased the necklace whilst on a holiday in Bavaria in the 1890s. The necklace which is a delicate ornamental work in platinum, is encrusted with diamonds and emeralds. The design used on the necklace is based on symmetrical flower motifs, a style that was common for jewelry crafting throughout the 19th century, a naturalistic style that used the "language of flowers." The thick circular band of the necklace is encrusted with diamond baguettes interspersed with round brilliant-cut diamonds. Seven floral motifs arise from the lower side of this band, which take the form of seven pendants. The largest of this floral pendant is situated along the median line of the necklace, and is encrusted with two large emeralds, a rectangular-shaped smaller emerald at the base, and an elongated oval or drop-shaped emerald in the center of the pendant, which is the largest emerald in the necklace. Both emeralds are surrounded by symmetrically placed leaf and floral motifs, encrusted with diamonds of different shapes. Three other floral pendants are placed on either side of the median pendant, with similar pendants occupying symmetrical positions. The length of these pendants gradually decrease outwards from the central pendant. As a result of this arrangement the lower ends of all the seven pendants roughly lie in a semi-circle. The three pendants on either side of the central pendant have a single large square or rectangular emerald, except the pendant just adjacent to the central pendant on either side of it, which has in addition another smaller square-shaped basal emerald. Thus altogether there are ten large emeralds on this necklace. The characteristic feature of this intricately designed emerald is its perfect symmetry, which can be checked easily, by picking out any point on the necklace on one side of the median line and looking for its corresponding point on the other side. It is seen easily that whatever point is picked on one side of the necklace, there undoubtedly will be a corresponding point on the other side. The Godman Necklace was purchased by the British naturalist Frederick Du Cann while on holiday in Bavaria, in the 1890s. It is not known from where and from whom the purchase of the necklace was made. The two Godman sisters claimed that the necklace originated from Empress Josephine of France, the wife and Empress consort of Napoleon Bonaparte. Perhaps this was what their father Frederick Du Cann told them. The period from around 1860 to around 1830, is known as the neo-classical era in jewelry crafting, and the jewelry produced during this period have typical shapes and ornamentation inspired by classical themes of ancient Greece and Rome. In France this period corresponds to one of the most tumultuous periods in its history, that included the French revolution and the conquests of Napoleon Bonaparte. The Godman Necklace doesn't seem to have many characteristics of the neo-Classical era and therefore doubts have been cast about its provenance from the period of Napoleon Bonaparte. The use of floral and vegetable motifs for jewelry designing became very popular during the Baroque period, that began in the early 17th century, and persisted into the neo-classical and modern periods. However, in the neo-classical period the floral and vegetable motifs were combined with classical themes of ancient Greece and Rome such as palmettes, rosettes, vases, urns, ribbon bows, hearts, stars, the crescent moon etc. There was a high level of symmetry in the neo-classical designs. The floral motifs and the high level of symmetry in the design are two features that point to its possible neo-classical origins. In the 1890s, when the necklace was purchased, Bavaria was still a kingdom ruled by the House of Wittelsbach. In fact, the Kingdom of Bavaria was ruled by the kings of the House of Wittelsbach for over 700 years, from 1180 until its fall in 1918. The royal court of Munich the center of the monarchy in Bavaria, rivaled the courts of Paris, London and Madrid in their extravagance and display of jewelry at court ceremonies. Thus it is quite possible that the Godman Necklace perhaps belonged to one of the monarchs of the House of Wittelsbach, and was designed and crafted by the artisans and craftsmen based in Munich, which like Paris and London was a center of jewelry designing and manufacture during this period. 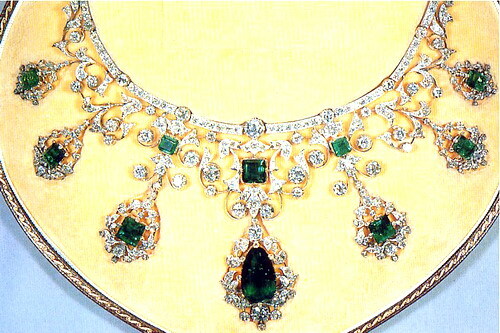 Frederick Du Cann gave the emerald and diamond necklace to his two daughters in 1965. Several years after the death of Frederick Du Cann his daughters wrote to the Lord Chamberlain, as the chief functionary of the royal court, that they believed they owned a piece of jewelry that once belonged to Empress Josephine of France, the Empress Consort and first wife of Napoleon Bonaparte. They further wrote that having a royal provenance the piece of jewelry might be of interest to Her Majesty Queen Elizabeth II, and that if it would please Her Majesty, they would be most willing to gift it to Her Royal Highness. The elderly spinsters received a response from the Lord Chamberlain, requesting them to meet Sir Francis Watson, the surveyor for the Queen's works of art, at an appointed time in their Bank, where the necklace was stored in a vault. The trio met at the bank as planned and the necklace was retrieved from the vault and handed over to Sir Francis, by the two sisters. The necklace was taken to the Buckingham Palace and shown to Her Majesty the Queen, who with her experience in handling and wearing exquisitely crafted jewelry from her own collection, was apparently very much pleased with the necklace she had just seen. The necklace was sent to the court jewelers and other experts of antique jewelry to verify its provenance, and doubts were expressed about its Napoleonic origin. The two sisters were informed of the findings, and the doubts cast on its royal provenance. Nevertheless the two sisters replied that they would like to present the necklace to the Queen if Her Majesty would be pleased to accept it, and also would like the Queen to wear it occasionally. The Queen was delighted to add the necklace to her collection, and to thank the sisters for their kind gesture, the Queen invited the two sisters to the Buckingham Palace for a private audience. The first British Monarch to differentiate the royal jewels into two categories the crown jewels and personal jewels, was Queen Victoria. The concept had already been introduced by Peter the Great in Russia in 1719, when he set up the Russian Crown Treasury to house a collection of jewels, which belonged not to the Romanov family, but to the Russian State. Peter the Great placed all state regalia in this collection, and declared that the state holdings were inviolate and could not be altered sold or given away, and he also declared that each subsequent emperor or empress should leave a certain number of pieces acquired during their reign to the State, for the permanent glory of the Russian Empire. Queen Victoria made it clear that some pieces belonged to the crown and were for use by any Queen to follow her, and that some pieces were her personal property, and hers to dispose of as she saw it fit. All British Monarchs after Queen Victoria had followed her in her footsteps, and had recognized the two categories of jewelry ever since. Thus the present royal jewels of the British royal family are also divided into the Crown Jewels and the personal jewelry collection of the Queen. The British Crown Jewels are on display in the Jewel House of the Tower of London, while the personal jewelry collection of the Queen is kept in a vault in the Buckingham Palace. Her Majesty Queen Elizabeth II has a large collection of personal jewelry from which she picks, to adorn herself during different state and public occasions, visits of foreign heads of state to the Buckingham Palace and other court ceremonies. Most of the pieces in the collection have been given to her as presents, during significant events in her life, before and after she ascended the throne, such as her 21st birthday, her wedding in 1947 to Philip Mountbatten and her coronation in 1953. She had also received significant pieces as gifts during her State visits and Commonwealth tours, and also official functions such as the launching of ships. 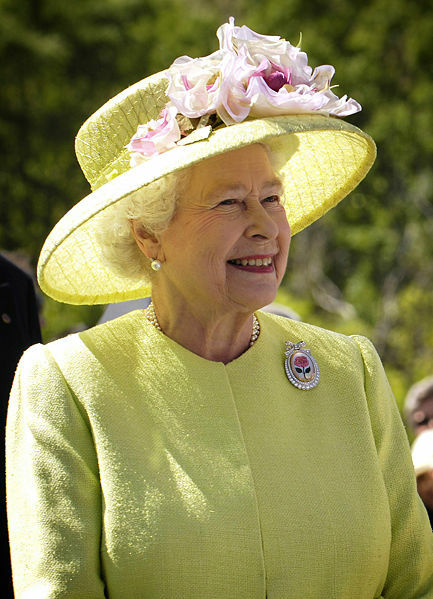 As of April 2006, Queen Elizabeth had undertaken over 256 official overseas visits to 129 different countries, and she had launched 23 ships in her life time. There are also many items in her collection, that she inherited from her paternal grandmother Queen Mary, such as the Cambridge and Delhi Dunbar Parure, a full fledged emerald and diamond suite consisting of a tiara, a choker, a pair of earrings, a necklace, a brooch, a stomacher and a pair of bracelets. Among her collection is also a small category of jewels which the Queen herself had purchased or has had designed and crafted by the court jewelers from existing stones or pieces from her collection. One of the magnificent pieces in her collection is the "Timur Ruby" a 352.50-carat spinel, inscribed with the names of some of the Mughal Emperors who were its previous owners. The Timur Ruby together with the Koh-i-Noor diamond were taken into the possession of the British East India Company after the capture of Punjab in 1849, and later dispatched by the Governor General of India Lord Dalhousie to Queen Victoria in 1850. The Timur Ruby is now part of a short necklace of four very large spinel rubies. The Prince Albert Brooch, a large sapphire brooch set with 12 diamonds, given to Queen Victoria by Prince Albert the day before their wedding is also part of her collection. Another brooch contains two large diamonds, the Cullinan III and IV weighing 94 and 63 carats respectively, which she sometimes jokingly refers to as "granny's chips." Another significant brooch in her collection is the "Flame Lily Diamond Brooch" given as a gift by the children of Southern Rhodesia for her 21st birthday. Another brooch in the form of a basket of flowers was a present from her parents to mark the birth of her eldest son, Prince Charles. The "Diamond Fern Brooch" was a gift by the women of Auckland on her visit to New Zealand during the Coronation Tour of 1953-54. During this same tour she also received a brooch of white and yellow diamonds forming a spray of wattle or mimosa, which was presented by the government of Australia. The "Williamson's Diamond Brooch' whose center piece is an exceptional quality 23.6-carat pink diamond discovered in a mine in Tanzania, and given as a wedding present to Princess Elizabeth in 1947, by Dr. John Williamson, the owner of the mine, is also an important brooch in the collection. Other prominent pieces in the collection are the Queen Elizabeth's 3-carat diamond solitaire engagement ring, designed by Prince Philip for his wife and set with a diamond taken from a tiara belonging to Philip's mother. The Cambridge Lover's Knot Tiara, that once belonged to the Duchess of Cambridge, and later passed down to Queen Mary, was also inherited by Queen Elizabeth after the death of Queen Mary, her grandmother. Another piece inherited from her grandmother is the "Rose of York" bracelet encrusted with rubies and diamonds. There are also pearl necklaces in her collection. A double-stranded pearl collection which is a family heirloom, was a wedding present to the Queen from her parents. She is frequently seen wearing this necklace on informal evening occasions. A triple-stranded pearl necklace in the collection was a present to the Queen from King George V, when she was young, She often wears this necklace during the day time. Among other pieces are Queen Mary's large ruby earrings, and a v-shaped ruby and diamond bandeau collar. The total value of her personal jewelry is conservatively estimated at around $57 million. According to the list of super-rich royalty compiled by Forbes Magazine Britain's Queen Elizabeth II, who has an estimated fortune of Â£349 million is the 12th richest royal in the world. In calculating her wealth most of her assets that are not personal possessions, but held in trust for the nation, such as the Buckingham Palace, the Windsor Castle, the Crown Jewels, and the Royal Art Collection are excluded. What appears to have been included in the estimation of her wealth are her personal jewelry collection, her personal art collection, a large stamp collection built up by her grandfather King George V, her annual income of around Â£12.5 million from the Duchy of Lancaster, and the income generated from the Crown Estate land, that had belonged to the royal family since 1066, that generated about Â£110 million a year, out of which Â£40 million is paid back to the British Government to cover the Monarchy's costs. It appears that the value of her three large properties privately owned by her have not been included in the estimation. These are Sandringham House, Balmoral Castle, and the Castle of Mey. These properties have never been valued, but the Balmoral Castle alone is reputedly worth about Â£160 million. The Crown Estate Lands are said to be worth over Â£7.3 billion, and has not been included in the estimate. The first in the list of Royals compiled by the Forbes Magazine is King Bhumibol Adulyadej of Thailand, the world's longest reigning monarch. with a staggering estimated fortune of Â£18.79 billion.